This post concerns large fossil-shark teeth belonging to the extinct Carcharocles megalodon (Agassiz, 1843), commonly called just "megalodon." Finding one of its teeth, which can be as large as 7 inches long, is something that tantalizes everyone from school kids to professional paleontologists. These teeth represent the largest shark teeth known, and they can be found in various parts of the world, including California. The following diagram shows the comparative sizes between megalodon and the great white shark, whose official scientific name is Carharodon charcharias (Linnaeus, 1758). The car is about the size of a "mini-Cooper." Actual skeletons of megalodon are not preserved because they consist largely of cartilage, which easily decays away after death of the animal. The size of megalodon, therefore, cannot be directly determined. Estimates for the largest ones range from about 14 to 18 m (40 to 60 ft.) long. Only the hard enamel of the shark teeth are normally preserved. Comparative sizes of megalodon, a modern great white shark, and a small car. As shown in the following sketch, the mouth of megalodon was big enough to accommodate six adults. Inferred reconstruction of the mouth of megalodon. A single shark can produce thousands of teeth during its lifetime because there are rows upon rows of replacement-shark teeth inside the jaws of sharks. That is why shark teeth are common as fossils. A section of a modern shark jaw. Length 25 cm (10 in). "Conveyor-belt"apparatus that delivers new teeth to the front of a shark's mouth when a tooth falls out. great white Shark teeth are never as large as than those of megalodon. Carcharodon carcharias (great white shark) teeth. On left, replica of a tooth, height 4.7 cm (1.85 in), Recent. In middle, an actual tooth, height 4.5 cm (1.77 in), late Pliocene age (3 million years old), southern California. U. S. quarter for scale. 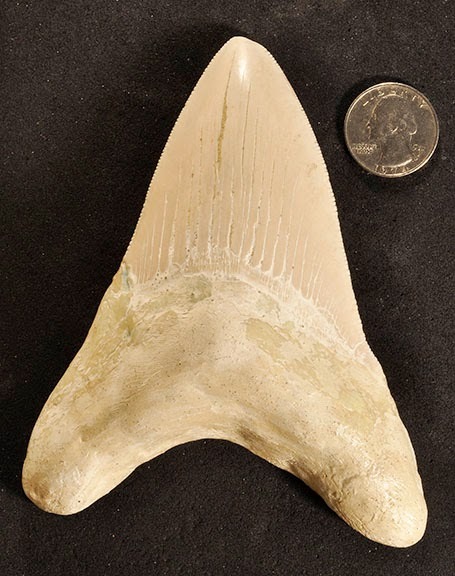 In addition, the bottom (root) of a great white shark tooth is generally straight to slightly curved, whereas the tooth of megalodon has a deep indentation (see pictures at the beginning of this post). The fossil record of Carcharocles megalodon ranges from the late Oligocene (25 mya = million years ago) to early Pleistocene (about 2 mya), whereas that of Carcharodon carcharias ranges from the middle Miocene to modern time. These two sharks apparently belong to separate families and evolved independently from one another. The size of the Megalodon and it's teeth amazes me! Found your blog. Its really nice on megalodon shark fossil teeth.I appreciate your article. Its important to get quality information on megalodon fossils teeth. So thanks for sharing all that important information.